The post election season has been characterised by tension arising from the house arrest of lead opposition leader Dr Kizza Besigye, a court case by former presidential candidate Amama Mbabazi and filing court petitions for MP, L.C and municipal elections. The Citizen Election Observers Network- Uganda (CEON-U) is concerned that the continued house arrest of the lead opposition candidate infringes on his right to freedom according to article 23 of the constitution. In article 43 of the constitution: (I) In the enjoyment of the rights and freedoms prescribed in this Chapter, no person shall prejudice the fundamental or other human rights and freedoms of others or the public interest. (c) any limitation of the enjoyment of the rights and freedoms prescribed by this Chapter beyond what is acceptable and demonstrably justifiable in a free and democratic society, or what is provided in this Constitution. Section 24 of the police act gives the police a right to arrest someone if he is a threat to public security, but CEON-U demands that police produces evidence that makes Besigye a threat to public security, otherwise will his arrest be indefinite. In a multiparty system, opposition parties should not be viewed as enemies of the state, but rather as groups that provide alternative Government programmes. As part of a process of increasing citizen participation in Uganda’s electoral process, CEON-U recently carried out an opinion survey on the recently concluded general elections. The survey was meant to expose electoral irregularities so as to provide a premise on how to better organise elections in Uganda. Consequently; 8 CEON-U managers visited areas where there is conflict, court petitions and requests for vote recounts to establish the causes of the disputed elections. The team visited Tororo, Gulu, Kotido, Butambala, Serere, Jinja, Mayuge, Iganga, Mukono, Kasese, Bundibugyo and Ntungamo. The managers worked closely with our long-term observers who are natives of the constituencies and the districts which they observed, before, during and are observing after elections. CEON-U held focus group discussions with members of the community, local council leaders, opinion leaders and voters from all political parties in the districts. CEON-U also met district police officials, district returning officers, registrars in courts of law and victims of electoral violence. Generally, the presidential and parliamentary elections were peaceful, but the period leading up to the election day was volatile in all the districts visited. In Mayuge for instance a man died under unclear circumstances. He was a supporter of Robert Ntende, an independent candidate. He is said to have been killed by supporters of Idi Isabirye. In Iganga at Idudi supporters of NRM and FDC clashed on the eve of elections over voter bribery. The NRM MP was giving out cash to voters who alerted FDC supporters. FDC supporters reacted by blocking the NRM from giving out money, the NRM called a NAADS soldier to rescue them. He came and shot dead a 25-year-old man and the crowd became more rowdy. And the soldier continued firing live bullets. In the process of the scuffle, a woman was shot through the arm and an s.3 student was shot through the neck. Both these people were not involved in the scuffle but had gone to the trading centre to buy food. This shooting took place at 8:00pm. (attached are the pictures of the victims of the shootings). The way results were tabulated and announced at the district provided a sharp contrast with what the locals had gathered from the polling stations. This happened for all the elections, presidential, parliamentary, district council and municipal elections. There are mainly two known political parties, the NRM and FDC; even though Uganda has 10 political parties. UPC which was once a known party is almost non-existent. In a strong multi-party dispensation system people are given an opportunity to have divergent views on handling issues of governance. A weak political party system promotes a one party system of governance which impedes institutional growth. The management of electoral processes by some of the district returning officials was poor. The LC 3 election had five candidates Joseph Bateganya Atumika, Bisusa Amisi Kafuko, Kirunda Isaac Kiwunda, Mande Milton and Mbulugu Emmanuel. On Election day the ballot papers that were supplied to the polling stations had wrong names. Mande Milton was called Mande Milton Kirunda. Also party symbols were mixed up between the NRM candidate and FDC candidate. This was sufficient ground for the election to have been cancelled. However, even when the Jinja district returning officer, Ambrose Mwaita was notified about the anomaly he told the candidate Kirunda Isaac Kiwunda that electoral commission Jinja was not going to do anything about this case. A case has been filed against the electoral commission in Jinja court by Kirunda Isaac Kiwunda. There are several other electoral disputes that have been filed in courts of law in the various districts. In Omoro Constituency there is a Petition: Simon Toolit Vs Oulanyah Jacob was logged in on March 24 2016. Simon Tollit is suing the Incumbent Oulanyah Jacob and EC over election mal practice. These included ballot boxes being kept away in a saloon, EC tampering with DR forms, EC using a Different format of the District DR Form to declare results among other things. In Mukono the parliamentary campaigns were characterised by violence and chaos. According to the electoral commission, Fatuma Ndisaba’s supporters used to beat up Betty Nambooze’s supporters during campaigns. There was also the problem of candidates campaigning beyond the stipulated for campaign time and supporters clashing after the campaigns. The military should be restrained from participating in elections, because elections are volatile in nature. Electoral commission should improve its image by investigating and eventually laying off district returning officers who are said to have altered DR forms and extorted money from candidates who wanted to be announced winners. All political parties should be treated equally and respectfully by the Government in power. The Government should seriously consider the electoral reforms that civil society presented last year. Presiding officers and polling assistants should be better remunerated to prevent them from being compromised during elections. Management of elections is not a single days event. Planning and training of officials, desk officers, middle level managers, desk officers, heads of departments on the process of elections should start the second month after the general elections. Training presiding and polling officials should be done a month to the elections to minimise errors on the DR forms. The democratic path is a long bumpy one, despite the many electoral irregularities that marred the recently concluded elections, the gains made over the last 30 years cannot just be thrown away. We need more concerted effort to promote true democratic ideals. For more information about CEON-U contact Dr Martin Mwondha on 0788929052 or email omwondha662@yahoo.com visit our website at http://www.ceonu.or.ug (CEON – Uganda) – Towards 2016: Conducting a Unified, Comprehensive and effective election Observation Mission in Uganda. You can also visit the FHRI offices in Nsambya. 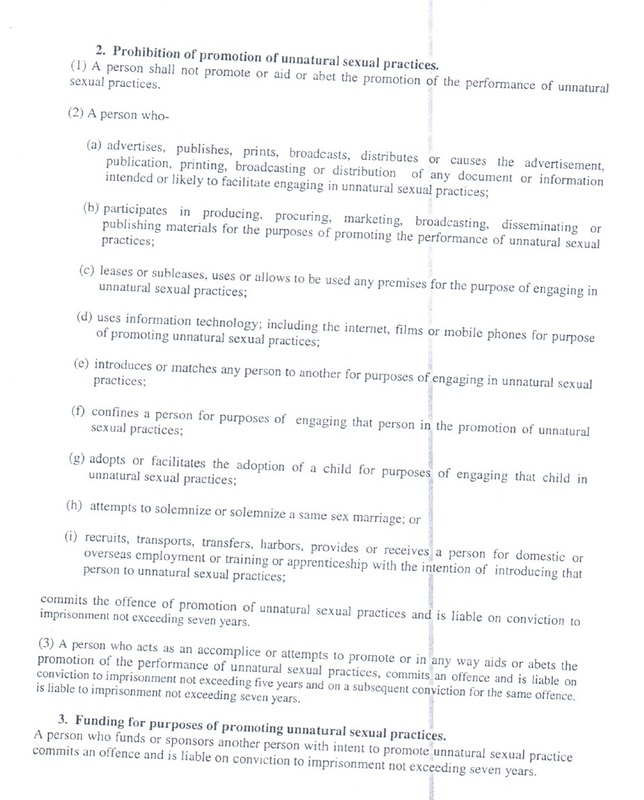 Today I will release a draft of a law called: ‘the Prohibition of Promotion of Unnatural Sexual Practices Bill 2014’. This draft was 29th October. It must be seen as a continuation of the 2009 “Anti-Gay bill” that became Uganda Anti-Homosexuality Act of 2014. Not that I have cared much about it, because I see the bigger picture. By all means no prosecution of any person is right or deemed fair, unless your proven guilty by rule of law. This law in the end didn’t get passed because of the Criminal Court of Uganda ruled the law invalid. Even though this happen. Still a few donor countries have sent fewer aid-dollars to government of Uganda. This is the governments of Norway, Netherlands and United Kingdom. I haven’t been vocal about that law like all the rest of the western hemisphere. For the simple reason: I don’t see the big fuzz about it. Not that I accept the principal or the matter at hand. I see a whole lot of other different other causes I will run into the storm for when it comes to Uganda. Before the cause of the gays and its importance in the discussion of making a better country, I’ll run many other marathons. Let me explain. I scream and fight for the lost causes and redeem souls. In that sense when it comes to first fights in development. I’ll stay the course for the 99% first then the 1%. I am not saying that the gays and the other part of LGBT don’t need safety. But doesn’t the teacher deserve a secure pay? The other part of government and civil service secure a decent salary? I will beat the drums to secure the righteous course of any citizen and on general basis, before any minority group. When you have society which is fabricated for one leading regime and its clients, then I got to stand up for anybody who wishes to succeed it and make a difference first. For the simple and expensive political freedom, liberty to really speak its mind, but also too make a honest living. Live in the hut, cottage, studio, the flat and make that your own castle; Because your free there. Not that the freedom to pick who love isn’t important. But when a great part of the country isn’t eating, elections are getting rigged; the defense force is used to persecute its own citizen, and those who can’t eat. Has to fight for the country in South Sudan, DRC, C.A.R. or Somalia. This money will be spent by the elite and not the soldiers risking themselves in the field either in an African Union operation or any other peacekeeping business. No, this money goes to the regime and gets pocketed. The honor of those men isn’t kept. The liberty and freedom and opportunities aren’t well shared. 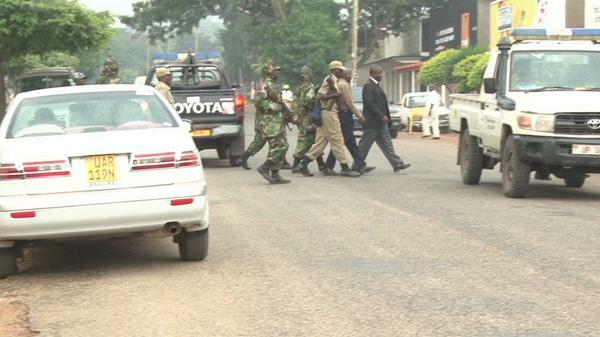 Where men of the UPC, DP and FDC can be taken by police and sent to Luzira. I am sure that the government’s spending money for development, but by far, many isn’t seeing that. But they complain about a gay law like lions on the savannah. So when I am dropping the draft today. I do it because it was delivered to me. I see it as a important thing to spread. Though I will always blast the graft, the corruption and the political insufficiency first, then I will address the other matters. Because when it comes to define ethics and also moral standards that are big question. Which can’t be addressed simply, so when the matters at hand and this draft which is a continuation of the “Anti-Gay bill”. Therefore I do this because of the necessity thought it’s only for the 1%. First and formost I’ll step up for the 99%. So while I am dropping this draft I am adressing two different tales that wont get into international press at all. First I will usually address the matters of Sam Mugumya the aide of Dr. Kizza Besigye who is wished to be taken for custody by the Uganda Police Force for the moment he is rumored to be in secure location in Kinshasa, DRC. Second is how certain journalist can be taken by the police without any trial Jonathan Akweteireho and the citizen Kanti Rogers in Masindi. They have been there for three days without any court trial or prosecution. So I would go for this kind of causes because of the neglect on the mayor media houses to address it. So somebody has to. Well here is the draft and if you despise my reasoning, be my guest. Answer me and tell me off. But if you can’t see it… then you are just seeing a slim picture that isn’t a whole tale and in living color. That’s you… and if that hurts you. I’m sorry. Peace. Because of the recent events and movements in Burkina Faso. Its good to use the words of a former President of the country let us all think and have clear mind of what is happening on the ground. We can get some insights and think. Which is a good thing.. Well here they are! They should be seen as relevant to the matter and actions happening right now. If somebody else will say them or follow the spirit of Thomas Sankara. Peace. Fred Enaga the Police Spokesman confirmed that 113 people are accused and arrested in connection with Bundibugyo and Kasese (SMSMedia, 2014). Fred Enaga commentes: “All the files of the suspects are in their advanced stage and awaiting the advice of the Director for Public Prosecution (DPP). They will be arraigned in court today (Friday) or early next week on charges of treason and concealing treason”(…)”They have all recorded statements indicating that they had a hand in the attacks”(…)”But if our investigations reveal that he (Omusinga Mumbere) was also involved in the attacks, then the law will take its course”(…)”two more people, including the minister of information and another person who allegedly helped the attackers to procure a witchdoctor from Democratic Republic of Congo have been arrested and detained at Kasese Central police station” (SMSMedia, 2014). Police say they have recovered 10 guns, 9 magazines and tear gas canisters stolen from them during the attack in Bundibugyo district on Saturday (UgandaRadioNetwork, 2014). Polly Namaye says: “that police has not under any circumstance attempted to summon or arrest the king” (…)” however does not rule out the possibility of summoning the king in connection with the recent attacks on the Rwenzori region that claimed over 90 people” (…)” that the kingdom Prime Minister Noah Nzaghale, and two other kingdom officials are still under police custody” (KFM, 2014). The Group fighting in the Rwenzori region has accused the government of misleading the people on the cause of fighting. 1 -In the first attack on Mubende police barracks, 9 policemen were killed and 42 guns captured. No causality on the attackers. 2 -The attack on Bundibujo army barracks, 214 guns,17 Machines and ammunition were taken, 192 soldiers were killed, attackers suffered 3 causalities. 4 -At Kaso and weighbridge a total of 24 guns were taken and Three Soldiers killed. According to the message from this Group, they described Museveni statement on the conflict as a meandering mind of a tired and deranged man. Will adress it more when I have more information. “All the files of the suspects are in their advanced stage and awaiting the advice of the Director for Public Prosecution.” – Rwenzori suspected attackers face treason charges.